Let Hammerworks light the way with expertly crafted Colonial Lighting Fixtures. First of all we offer a complete collection of superb quality handmade copper & brass lighting. More importantly since 1979 we have proudly created period reproduction lights in America. Not only that, we use the best materials available offering several finish options. Likewise, select from a wide variety of outdoor lantern styles. We offer copper post lights, Early American wall lights and Colonial Hanging Lights. In addition, see our exclusive collections of Gooseneck Sign Lights, Olde English Tudor and Craftsman Style Lights. No matter your preferred home design you’ll find compatible fixtures. Thus, from a Traditional Colonial to a Cape Cod Cottage or New England Farmhouse as well as an Arts & Crafts Bungalow Hammerworks is your best outdoor lighting source. Of course our Handcrafted Colonial Style Lighting Fixtures do not stop at the front door! Our vintage lights are ideal for every room inside your home. We make many styles of period antique reproduction Wood, Tin or Brass Chandeliers. Furthermore, you will find a wide variety of Rustic Colonial Wall Sconces, Ceiling Fixtures and Punched Tin Pendant Lights. So take a few moments to browse our website. You’ll see that from a small powder room to a large great room we have the Colonial Lighting Fixtures for you! Most of all we continually strive to offer the highest quality, value and customer service available. Especially relevant we offer Colonial Outdoor Wall Lanterns in several styles, size and finish options. Above all, we handcraft Outdoor Rustic Colonial Lanterns with attention to detail and historical precision. Of note, popular wall lanterns include the classic Cape Cod Onion Wall Lantern. We also make Early American Primitive, Traditional Colonial Williamsburg, and English Tudor Lighting. More importantly we handcraft each reproduction collection in several sizes. Thus,no matter the style or size you will find vintage outdoor lights perfect for your space. Certainly you should also consider finish choices. The standard options are solid copper and brass. The hand rubbed antique copper and brass finish adds an attractive satin sheen to the lantern. The finish darkens naturally over time. Or you may prefer the rustic look of the verdigris finish with its weathered appearance. In contrast, the painted black finish adds a polished look. Especially relevant, combining your Colonial Wall Lanterns with matching copper post lanterns and hanging light fixtures creates a uniform appearance. Above all we offer lantern styles from primitive to traditional. Within our primitive fixture selections the Pyramid Collection is a popular choice. Furthermore,either of the Colonial Reproduction Home Lights W102 or W106 add the finishing touch to any antique reproduction home. For a classic appearance consider Traditional Wall Lanterns WML102. Certainly the simple yet graceful lines of traditional lanterns add a sense of elegance to your home. Of course, we also offer the popular Cape Cod inspired Colonial Onion Wall Lights in a variety of sizes. Also the English Tudor collection offers a look like no other! Therefore, no matter the architectural style of your period home you will find the right Outdoor Copper Colonial Wall Light at Hammerworks. Similarly we make our handcrafted Colonial Post Lanterns to match perfectly with the wall lanterns. Furthermore styles of Outdoor Copper Post Lanterns include Traditional, Rustic Primitive, Classic Onion and English Tudor. Of course, we also offer a choice of antique copper, brass, verdigris or painted black finishes. Also we equip each post lantern with a 3″ post fitter, correct for any pole. Thus, when you purchase one of our Colonial Style Light Poles your post lantern is easily installed. Most noteworthy, by nature solid brass and Copper Outdoor Post Lanterns will not rust or corrode, lasting for decades. Along with complementing the wall lanterns, rustic post lights match perfectly with outdoor Colonial Hanging Lights. No matter what, the classic style of Copper Post Lights, wall lanterns & hanging fixtures has lasted for centuries. They continue to light the streets & buildings of cities and towns today just as in Early America. As a result due to the quality and correctness of our copper outdoor post lanterns they are often chosen for municipal and historic restoration projects throughout the U.S. Likewise we offer a broad selection of antique reproduction New England Colonial Tin Chandeliers. Consequently models include primitive antique tin & brass chandeliers, punched tin pendants, French Country Chandeliers and hand turned Colonial Wooden Chandeliers. More importantly styles range from primitive to formal & traditional. Additionally sizes go from the petite CH103A or Tavern Light to grand 2 or 3 tier models like CH303 & CH322. Therefore you can find exactly what you want. Of course, Early American Chandeliers are hand made using only high quality solid tin, brass or hardwood. In terms of illumination each primitive style chandelier is rated for 60 watts per socket (arm). Furthermore we provide a matching ceiling canopy and 2 feet of chain with each chandelier. Additional chain is available for a minimal charge upon request. In the same manner, we handcraft Colonial Wall Sconces in a variety of styles and finishes. Most importantly, you will always receive quality handmade 18th century Rustic Primitive Wall Sconces. Certainly, we use only high quality solid copper, brass or tin to create each sconce. Consequently, this allows flexibility in coordinating the color scheme and style of any setting. As far as style, sconces range from simple and primitive to the formal Rustic Cut Mirrored Tin Wall Sconce. Above all tin sconces combine beauty and function. They are a perfect decorating accessory for any period reproduction room. Not only that they coordinate wonderfully with a wooden chandelier or perhaps our Antique Tin Colonial Ceiling Lights. Most notably, if you have an area needing extra light we make several Colonial Wall Sconces with 2 or 3 candles. Therefore since each antique reproduction wall sconce is rated for 60 watts per socket it assures plenty of light. 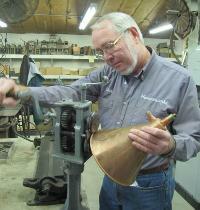 Certainly with our capability to create and handcraft sconces, we welcome custom orders. Whenever you want a “primitive” sconce simply request our Rustic Tin Wall Sconces in a non-electric candle version. While our main focus began creating handcrafted Colonial Fixtures, the transition to designing Arts & Crafts Lighting was logical. Therefore In our collection of Craftsman Style Lights you’ll find a line of classic reproduction lanterns. The same excellent quality workmanship and attention to detail is evident throughout. Such simple details as the hand hammered rivets and the textured back set these Mission Style Lights apart. As always the Arts & Crafts Collection includes everything you need to complete your design scheme. Thus, you can choose from Craftsman Style post lanterns, wall lights, hanging & ceiling light fixtures and wall sconces in a choice of antique copper, brass or verdigris finish. In addition, we offer several glass color choices to complete the authentic look of these classic Frank Lloyd Wright inspired designs. Another original choice is our selection of handcrafted Gooseneck Lighting. One of our most popular models, the Gooseneck Sign Light SL501 features a unique design found only at Hammerworks. Also known as Sign Lights, we make them in your choice of solid copper or brass. In addition, we offer a verdigris finish. Furthermore, on most models the steel arm is powder coated black for a handsome contrast. Not only that, you can choose between either hand crimped “pie plate” or streamlined cone shade styles. Also since we offer a variety of size and arm configurations there are many custom options. In terms of illumination most Gooseneck Lighting fixtures accommodate up to 150 watts in a standard medium base socket. More importantly our Gooseneck Sign Lights are made completely by hand in the USA. Although Gooseneck Lighting is meant to shine on storefront signs, residential usage is also common. Consequently, they are a great option to light up many outdoor areas. Therefore, Gooseneck Doorway Lighting offers a distinct look for your home entry, garage, deck or patio. Of course just the same as all outdoor copper light fixtures, copper Gooseneck Lights will not rust or corrode. Not only that, the clean simple lines of Gooseneck Lighting complements the design of handcrafted Colonial Lighting Fixtures. As a result, you can easily combine Gooseneck Lighting with perhaps the Cape Cod Style Post Lantern or Cape Cod Colonial Wall Lights. While Gooseneck Light fixtures are chiefly intended as exterior fixtures, they are also great indoors. The SLS509 straight arm option makes an ideal pendant light. Consequently, you can group them together over kitchen counters, islands, and even pool tables. Or create a striking impression by installing them over a bathroom vanity. In addition, restaurants often use them above salad bars or booths. Thus, from commercial uses to contemporary kitchens and beyond Interior Gooseneck Lighting is a unique option for your design scheme. Certainly, it is evident solid copper or brass Gooseneck Lighting offers a variety of flexible solutions to your needs. In addition to outdoor sign illumination, successful usage of Gooseneck Sign Light fixtures include outdoor home, barn and garage doorways as well as kitchen, bathroom or pool table lights.